After making quite a few waves last week with some pretty unbelievable introductory deals on the company's more affordable high-end 2019 model, LG is today finally ready to share the official pricing information of the V50 ThinQ 5G. Only for Korea (predictably enough), as Sprint and Verizon continue to keep things vague in terms of the ultra-powerful phone's US availability. But just like we did a few days ago with the Samsung Galaxy S10 5G, we'll try to put these newly revealed figures in the right regional perspective, and more importantly, predict what it all means for prospective US buyers of the LG V50 ThinQ 5G. Granted, the sample size may not seem large enough to draw conclusions about 5G-enabled smartphones in general. But clearly, the first wave of these blazing fast mobile powerhouses is not as insanely expensive as certain analysts suggested and many consumers feared. Naturally, the Galaxy S10 5G is a couple of hundred bucks pricier than the 4G LTE-only S10 and S10+, and the same goes for the V50 ThinQ 5G when compared to the G8 ThinQ 4G. Namely, we're looking at a starting price of 1,199,000 won in LG's homeland for the company's most advanced handset so far announced this year, while the smaller and slightly less beefy G8 costs KRW 897,600 in an entry-level configuration. Those two numbers directly convert to $1,055 and $790 respectively, although you probably already know that's not how US price tags are determined. For instance, the unlocked LG G8 ThinQ fetches $850 stateside (at least in theory, because in practice, you can already get a massive discount), which most likely means the V50 ThinQ 5G is looking at an official US price of between $1,100 and $1,200. LG actually acknowledges that's "unusual" and relatively hard to swallow, explaining the high retail costs are a result of integrating various "5G signal processing components", which require "large capacity batteries and powerful heat dissipation devices" to "stably implement 5G performance." Of course, it doesn't come as a surprise that 5G needs more power, eating up a lot of energy in the process, which is why we're hardly shocked of the price point unveiled today in Korea. Can the LG V50 hold a candle to the Galaxy S10 5G? While it would be undeniably foolish to try to definitively answer that question until we get a chance to rigorously review these phones, it's fairly obvious Samsung has a few important advantages in this heavyweight battle. Namely, a fourth rear-facing camera (the LG V50 "only" has three), two extra gigs of RAM (8 vs 6), and more internal storage space (256 and 512GB options vs a single 128 gig model). The LG V50 ThinQ 5G also comes with a smaller screen and battery, although that's not necessarily a disadvantage. Not for everyone, at least. But these differences certainly explain why the 5G-capable Galaxy S10 version is 200,000 won (around $175) costlier than its direct rival. Interestingly, LG wants to take on the Galaxy Fold as well (kind of) by releasing the V50 ThinQ alongside an optional "Dual Screen" case. That basically transforms this "conventional"6.4-incher into a foldable device... of sorts, with a secondary 6.2-inch display in tow enhancing the user's productivity and multitasking by enabling sleek new use cases. You can use the two screens separately or together in a number of interesting scenarios (LG seems to be mainly focusing on gaming enhancements), and the inventive accessory is priced at the rough equivalent of $190. 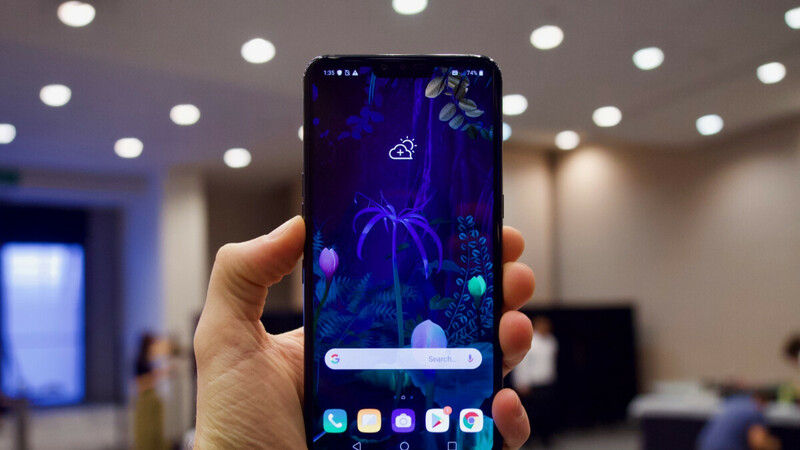 Both the LG V50 ThinQ 5G and its Dual Screen attachment are scheduled for an April 19 launch in Korea, which means the Galaxy S10 5G will get a commercial head start of exactly two weeks. But that's nothing compared to how long we must wait for 5G speeds to become available on a large scale around the world. Price is one reason why I won't be replacing my LG V30 with a V50. Lack of updates to Pie are another. And that God-awful notch is yet another reason. I think I'll save up for a OnePlus device later this year. I'm thinking of picking up a cheap V35 off Ebay to replace my V30. Nothing released since is desireable to me. LG has very little importance in the mind of the consumer. LG needs to rebrand their mobile division with a fresher approach. All the gimmicks will be forgotten,just nail the core tenants of a great device with something to genuinely stand apart. More team ups with other brands for themed mods...something.